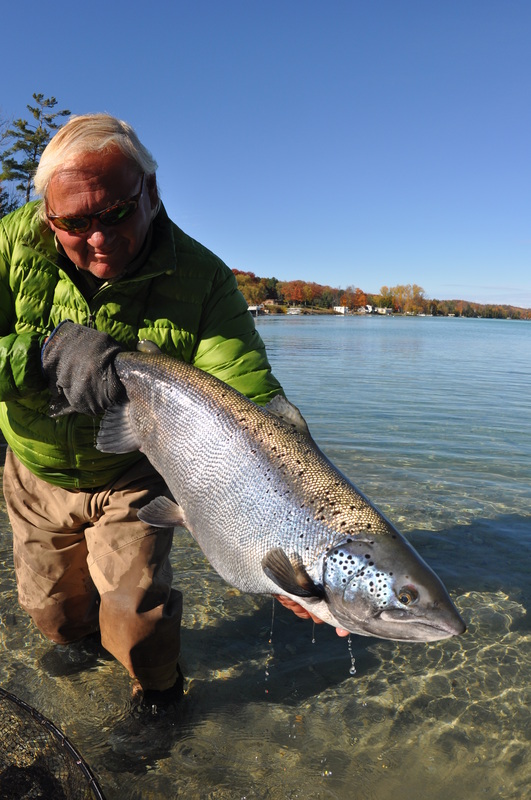 Matt Supinski: Daiichi Pro Staff, Showing the World Record IGFA Landlocked Atlantic Salmon, 27 Pounds. Matt Supinski is a fly fishing guide/outfitter/instructor, lodge owner and operator, free-lance writer and photographer, book author and culinary trained chef from Newaygo, Michigan. He has been fly fishing since the age of seven for 46 years, having been brought up in the Niagara Frontier of upstate New York and spending time as a boy in Poland. CULINARY/HOTELS/RESTAURANTS: His degrees are from the Ohio State University- B.A School of Business, and the Culinary Institute of America. Prior to being a full-time fly fishing guide/writer/author, he was in the international corporate hotel business working in Europe and the U.S. for several hotel chains- Sheraton, Omni, Renaissance and Westin hotels in food and beverage management. His highest attained position was Assist. V.P. of Corporate Food and Beverage for Omni International Hotels and V.P. of Food and Beverage for the Amway Hotel Corporation at the Amway Grand Plaza. He is very familiar with Mobile/AAA/Michelin rating systems and food critics with various hotel/restaurant industry and national publications. He has written countless magazine articles in the 1980-early 90’s for hotel/restaurant/resort and culinary magazines. In 1995, he opened his Gray Drake and Trout & Eagle Lodges (www.graydrake.com), which he and his wife Laurie have been operating for 18 years. He guides clients for trout, steelhead and salmon 280 days a year on Michigan’s Great Lakes rivers like the Muskegon, Pere Marquette, Big Manistee and St. Joseph. He has fished from Russia to Europe, the U.K., Iceland and extensively throughout all of North America. FLY FISHING: Matt’s book authorships have been best sellers and have spanned 16 years. They include: River Journal: Pere Marquette ( Amato Books 1995), Steelhead Dreams and Steelhead Dreams 10 Year Anniversary Edition (Amato Books ,2001/2013), Orvis Guide to Great Lakes Salmon and Steelhead ( Lyons press 2004), co –authored contribution to Orvis’s Ultimate Book of Fly Fishing ( Lyons Press, 2003 –Tom Rosenbauer), co-authored contribution- The Art and Science of Fly Fishing ( Lenox Dix- Amato Books-1993). He wrote the forward for Karl Weixlmann’s Great Lakes Trout and Salmon (Stackpole- 2009). LATEST BOOK RELEASES 2013/2014: His new Steelhead Dreams 12 Year Anniversary -Frank Amato Publications, released October 2013. His new major book, (current best seller on Amazon, Ebay, Barnes and Noble and world-wide markets including Japan and China), which was a 10 year project, Selectivity; The Theory and Method of Fly Fishing Fussy Trout, Steelhead and Atlantic Salmon Around the World, Stockpole Books, was released January 2014, 300 pages, 400 color images and 900 fly patterns and recipes. Matt has also been featured in the following books: The Angling Life ( Clarkston Potter Publishing-2000), Fishing for Great Lakes Steelhead ( West River Press-Kustich brothers-2000), Michigan Blue-Ribbon Fly Fishing ( Bob Linsenmann-Amato Books-2002), Trout Streams of Michigan ( Backcountry Press- Linsenmann and Nevala-2001), Wisconsin Blue-Ribbon Fly Fishing ( Chris Halla- Amato Books-2001), The Muskegon-Majesty and Tragedy ( Jeff Alexander- Michigan State Univ. Press), DVD/T.V. : Matt has appeared on national TV for Barrett’s Productions, Fly Fishing the World, Fly Fishing America on ESPN Outdoors and the Outdoor Life Channel ( 2004/2006). Matt recently released his new DVD- Selectivity-Trout ( 2013), and numerous PBS fly fishing and culinary programs in various U.S. cities (1991-2010). He is currently involved with a new TV program scheduled for 2015 on National Geographic Travel channel called, The Epicurean Fly Angler. PHOTOGRAPHY: Matt has had 7 cover shots for Fly Fisherman, Fly Fishing and tying Journal, Fly Fish America, American Angler – also two covers on the Orvis Annual Fly Fishing Catalogue. Three covers featured him and one of his wife Laurie. FREE-LANCE FEATURE WRITINGS: Matt’s first article was published in 1989 in Fly Fisherman –entitled Big Limestone Trout (under the tutelage of his mentor, Nick Lyons). Matt has also had the honor and pleasure to have been mentored and have fishing acquaintances with notable American and British fly fishing icons as Vince Marinaro, Carl Richards, Ed Shenk and Dermot Wilson. He has then gone on to have more than 280 feature pieces published in Fly Fisherman and the following magazines and periodicals: Fly Rod and Reel, American Angler, Fly Fish America, Eastern Fly Fishing, Trout, Wild Steelhead and Atlantic Salmon, Fish and Fly, Fly Fishing and Tying Journal, Salmon-Trout-Steelheader, Midwest Fly Fishing, Orvis News, Field and Stream, Outdoor Life, Atlantic Salmon Journal, Sports Afield, The Field (U.K.), Fliegen Fischen (Germany), Wild on the Fly, Michigan Fly Fishing Journal, Michigan Outdoor Journal, The Fly Fisher (FFF) non-fly fishing periodicals. Matt has also had articles in the following magazines: Forbes, Men’s Journal, Outside, Gourmet, Food & Wine, The Wine Spectator, Hotels Restaurants and Resorts, Midwest Living, Southern Living, Lake Magazine (Luxury Great Lakes Living), Mid-Atlantic Journal, Kaatskill Life, Blue Magazine (Michigan’s Lakestyle Magazine), and Washingtonian Magazine.